Hi again 7 Dots Studio fans – today we’ve got a special treat for you: fabulous creations by Adreinne Ford, our guest Designer for this month. We are sure you will love her projects as we do! Hi All! 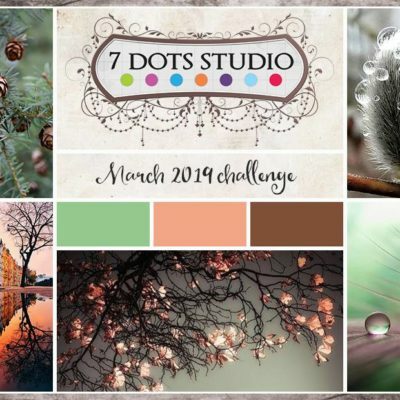 I am over-the-moon thrilled to share that I was recently asked to Guest Design for 7 Dots Studio—–I am star struck— this company is incredible, their product TOP NOTCH, and the designers—- swoon worthy! 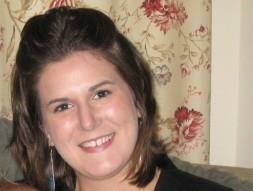 My Name is Adrienne Ford. I was born and raised in Pennsylvania and currently live here with my loving husband, and two beautiful babies- Luke, my rough and tumble yet sweet as pie two year old and my beautiful baby girl Karina. I am a kindergarten teacher by trade, but have left that field to be a stay-at-home mama for the time being. I have enjoyed going down this road of staying at home with my kiddos, but I could not do it without a cup of coffee in hand! I got into scrapbooking when my son was born in 2010, so I am fairly new at this awesome hobby. I found that I not only needed a way to house all my gorgeous photos of him, but I also needed a creative outlet that was just for me. ( My husband was also was begging me to get a hobby!) Since then I have been evolving as a scrapper and have been creating like crazy! As for my style, I love to try new things and work with several types designs, mediums and colors. 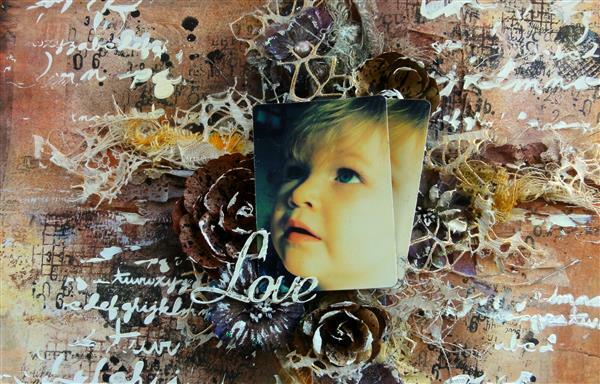 However, I have come to find that my “style” has become much more refined since beginning my scrapbooking adventures. 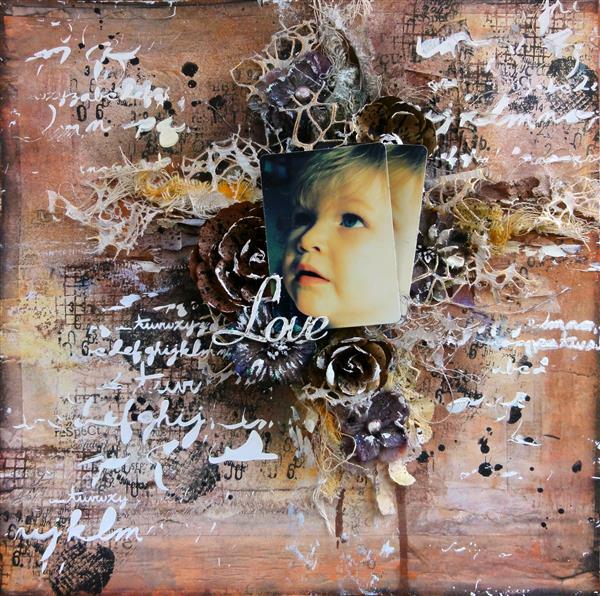 I LOVE mixed media and adore working with art mediums of all types. I primarily start my creative process by choosing a patterned paper or an embellishment I really would love to work with, and then use that as a springboard for my color choices, photos etc. I almost always apply Gesso, misting and stamping to my backgrounds and then go from there. 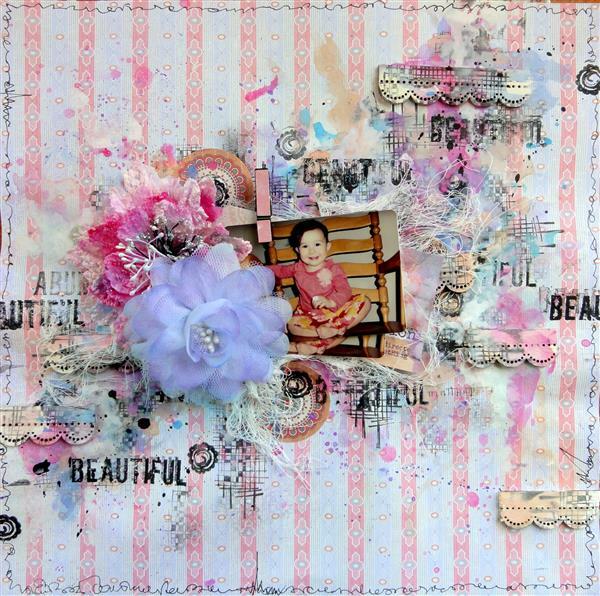 I love to experiment with color, flowers, chipboard, and misting. I was so happy to receive a box full of yummy paper products from 7 Dots Studio and I have them to share with you today! I have four very different layouts- each tailored to suit the paper’s design. I LOVE playing off paper- looking at each one carefully to see what fun little details it holds. You can see for the first one, I chose to work with the amazing Dreamer Collection. The colors of this line are darker, more dramatic, and so beautiful. For this one I played off the color palette, first choosing a photo that would compliment the paper! That is half the battle in my opinion as if the photo clashes with the paper the whole process is that much harder. 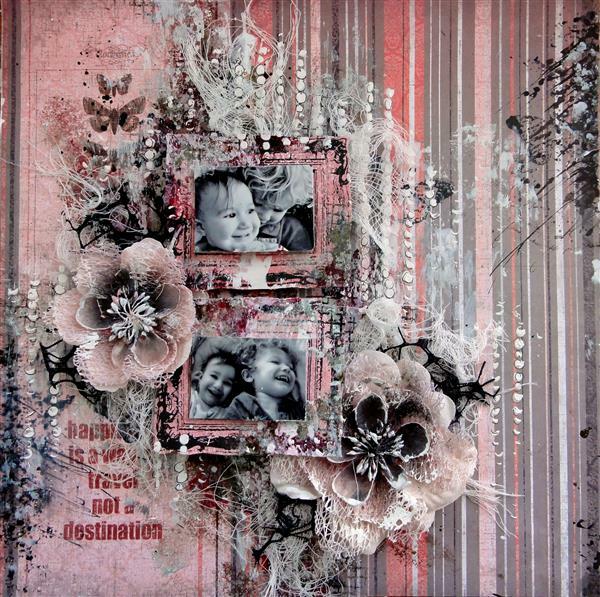 I picked some grungy stamps for my background, a mixture of textured fabric, and a few flowers which I have misted to have them all work cohesively together. The final step I found was that my design was missing something- something bold. I took a stencil to it with gesso, which has added so much to the final result. 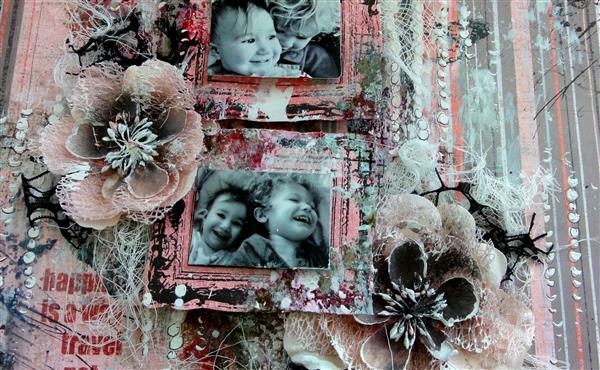 The stenciled image definitely creates a contrast that I was looking for! For my next one, I wanted to have some fun with this playful print from the Hopefully Collection. The paper was fun and prefect for a photo of my daughter . The add-ons to the collection had stickers and a tag that their colors complimented the colors in my photo quite well. I then played off those colors in creating my background. I have used all water colors to achieve the look excluding my white mist that I used as a “paint” at the end to tone the colors down here and there. I have added some fun stickers and a tag behind my photo. For Queen of Hearts- I went with a black and white photo of my kiddies….. I had two different wallet size photos that were meant to be a pair. 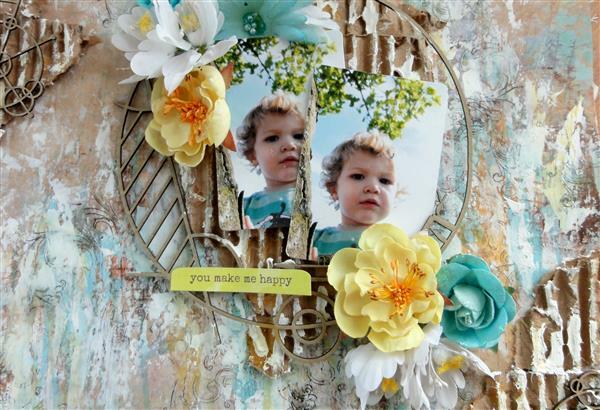 I took a stamp set of Vintage Mirrors and stamped the image onto 7 Dots paper, I then cut the frames out and added some dimensional tape behind them to give them a lift off the paper. 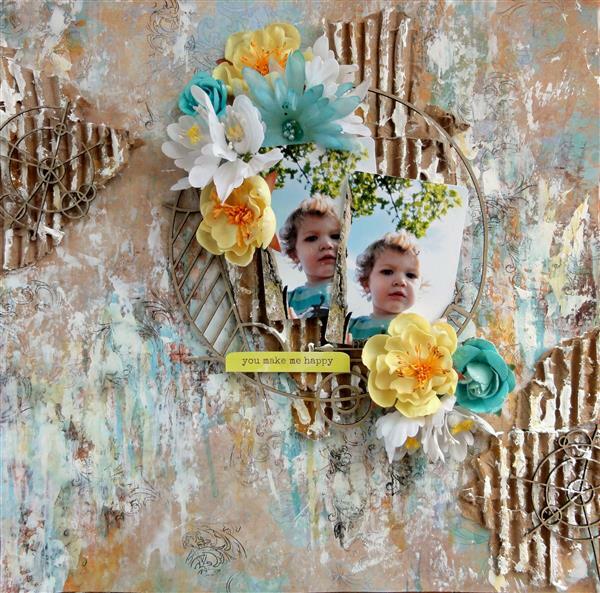 used tons of mediums as well as using a Stencil and Gesso to highlight the vertical lines in the patterned paper. I also added some black here and there to give some shadowing and contrast. For my last one, I adore this collection! Love Is In The Air is AWESOME! WOW! Beautiful textures and prints. I love the colors of this particular paper— the earth tones are beautiful against the blue shades….. I added some cardboard that I ripped into pieces to add lots of texture and give some added interest. I really whitewashed quite a bit of the paper and then added various mists in coordinating colors. I have also added some coordinating Scrap FX Chipboard pieces to the composition to help add a very masculine, yet fun boyish page. Of course I added the girly flowers too- couldn’t quite help myself! LOL! I want to thank 7 Dots for this AWESOME opportunity! I am so humbled by their talent and asking me to showcase their product has been a wonderful opportunity!